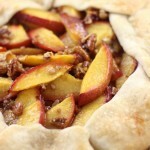 A super simple rustic galette with juicy and ripe peaches, a splash of bourbon, and crunchy, buttery pecans. I learned recently that you guys really like bourbon. You lushes you. The Bourbon Cherry Brownies with Brown Sugar Frosting were a big hit. I’m so excited that you all liked them, and I couldn’t agree more that baked goods with bourbon are some of the best. It makes a person kinda want liquor in everything you make when you head down that road. Like, for example, Amaretto Crepes or Irish Cream Brownies. All the liquor, all the time. You know what, I’ve just been inspired to do Liquor Baking Week – all baked goods with liquors. That would be really fun. Maybe too fun. I have some rum stuff in the pipeline soon, so there’s more liquor desserts to look forward to! 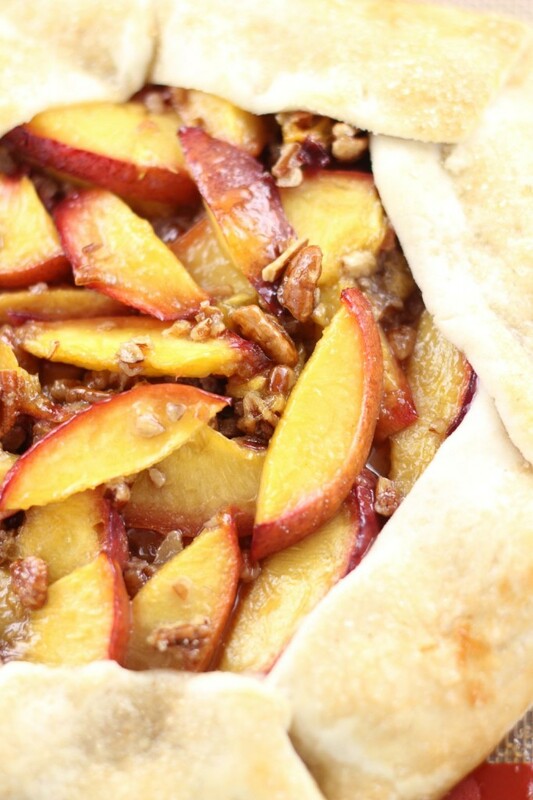 I already had this Bourbon Peach Pecan Galette made and was in the mood to share it anyway, so let’s keep the bourbon train going. What I love so much about this galette, besides how the bourbon adds richness and deepness to all the other flavors, is the fact that it’s so ridiculously easy. Galettes are like the lazy person’s guide to making a pie. I had this puppy assembled in about 8 minutes. All the glory and awesomeness of a fruit pie, with about 1/10th the work. Slice the peaches (don’t even peel them), toss them with bourbon, brown sugar, and pecans, arrange on the store-bought pie crust (take the shortcut), and bake for about 20+ minutes. That’s it. So simple and quick. The flavors are tremendous. Again, I just can’t explain how a little bit of bourbon does SO much. The impact of it is extra caramel-like, rich flavors. But it’s more than that, I just can’t put it into words for you, unfortunately. 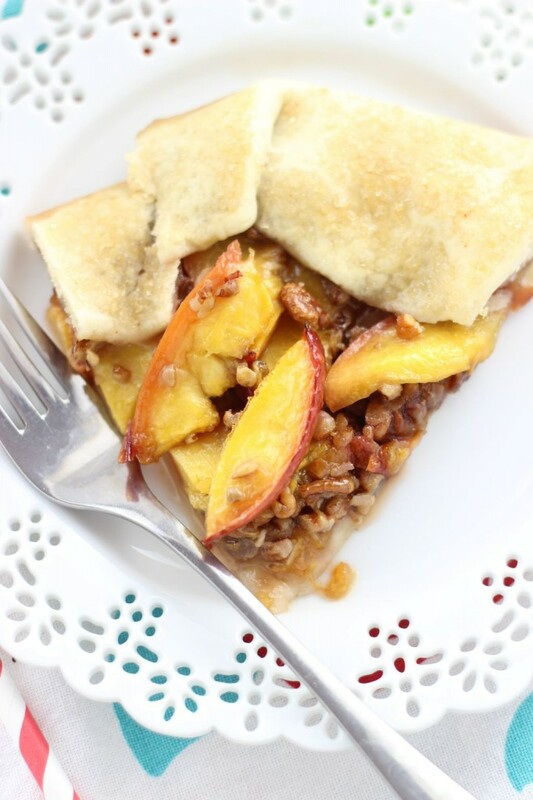 With juicy ripe peaches, toasted pecans, and lots of brown sugar, put together quickly and easily in a pie crust, this summer dessert is one you must try! 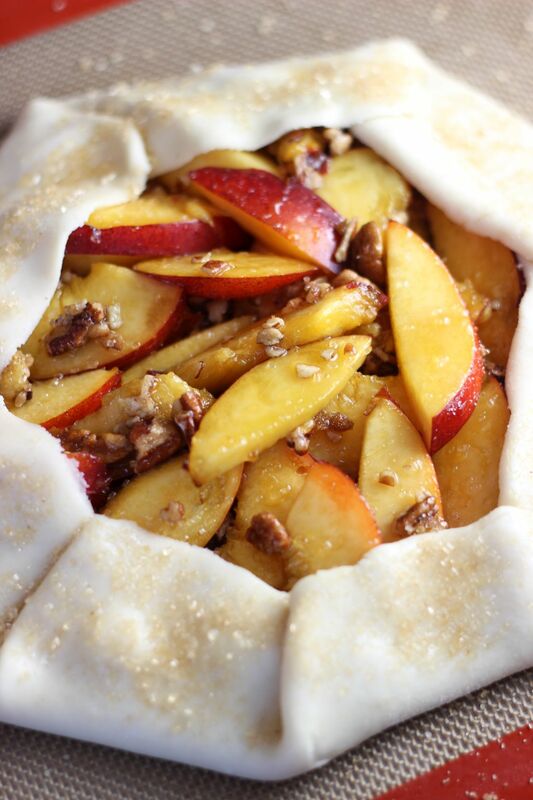 A super simple peach galette with brown sugar and bourbon flavors. On a large baking sheet lined with parchment paper or a silicone baking mat, unroll the pie crust. In a large bowl, combine the peach slices and bourbon. Toss to coat, and allow to sit for 10 minutes. Add the sugar to the peach slices, and toss to coat. Arrange the peach slices in a circle in the center of the crust, leaving 1.5-2 inch border at the edges. Fold the edges of the dough over the filling, overlapping where needed, and pinching to seal any cracks. Brush the crust lightly with egg white, and sprinkle with turbinado sugar. Bake at 375 degrees for 25-30 minutes, or until edges are golden brown. Allow to cool for about 10 minutes before cutting into wedges. Serve warm! This looks so lovely! 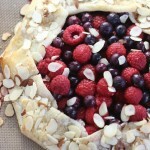 I have yet to make a galette, but this looks so simple and delicious. Love the bourbon and peach combo. Galettes are nice because they are so simple!! I’ve honestly never heard of a galette, but it looks fantastic. Thanks for sharing it. 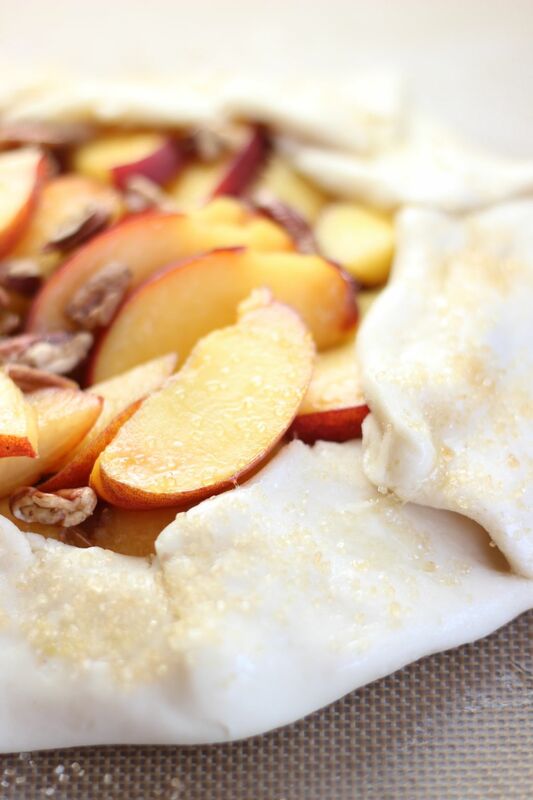 Everything about this galette has my name all over it! Love the bourbon peaches and pecans. This is such a great recipe, Sarah! 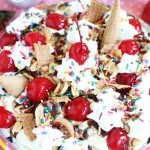 This looks like a delicious recipe and so simple to make. 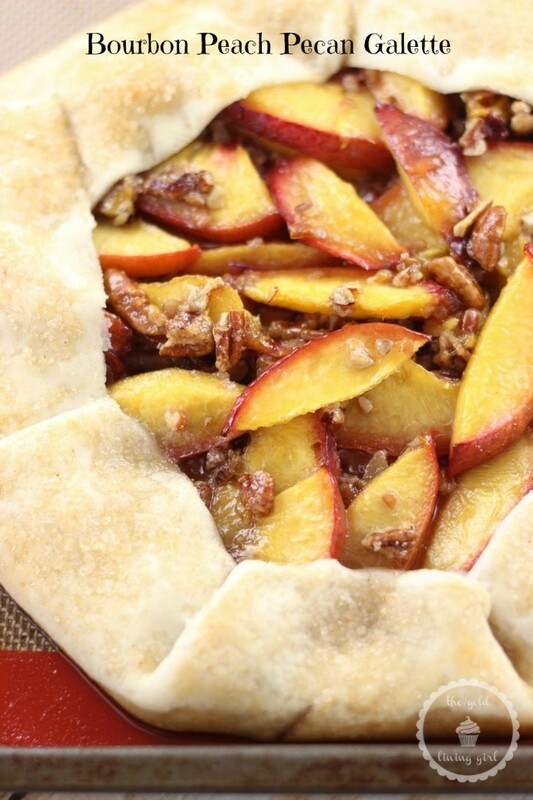 Peaches and pecans make such a wonderful combination. 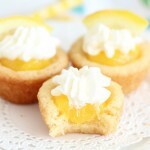 Thanks for sharing this recipe idea with us on #SmallVictoriesSundayLinkUp. I hope you’ll join us next week. I need this immediately! Thanks for linking up with What’s Cookin’ Wednesday! 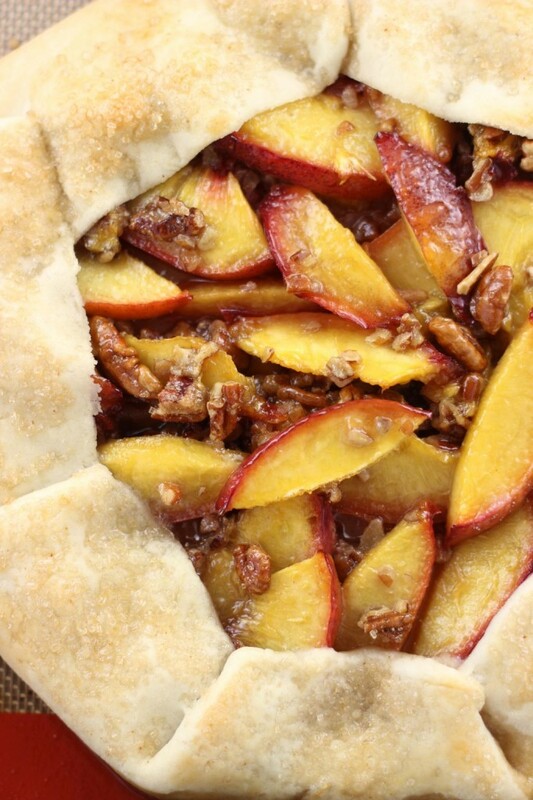 Peaches, pecans, pie crust, oh my! doesn’t even need the bourbon for me. I included this in my summer produce round up for tomorrow. Oh, thank you so much! I really appreciate that! So glad you like it. 🙂 I only like bourbon in baked goods. Haha! 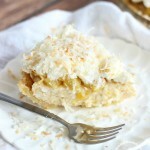 Thank you for linking up to last week’s Tasty Tuesday link up. 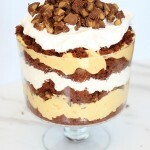 I have pinned your yummy recipe to the Creative K Tasty Tuesday Pinterest board. I hope that you’ll stop by this week to link up again!